International Business Machines, or IBM, is one of those iconic brands that have helped shape the way we view our world. For business students, many are aware of their recent shift away from the personal computer market and into the technology services arena. For rest of the world, many more people are beginning to see IBM as an exemplar of corporate social responsibility. This last Thursday, at the Stamp Student Union, the Center for Social Value Creation hosted the 4th annual Social Enterprise Symposium and the first keynote speaker of the day was Stan Litow, Vice President of Corporate Citizenship & Corporate Affairs for IBM. As many eager faces filled the audience, I sat ready to hear all about the same old green initiatives and pro-bono projects that help only a few. I should have known better. In these economic times, it’s maybe a bit too easy to expect the bare minimum. After hearing what Mr. Litow had to say, and following up with a little more research, I can honestly report back that this company knows a thing or two about the reciprocal value of public service and development. Among the projects that the three hundred thousand person firm works on, I’d like to point out a couple that hit home for me. First off, IBM runs a program called Corporate Service Corps. Coming from a former Peace Corps Volunteer, I admit that I winced when I first saw the name of this program up on the screen. Part of me believes that ventures like an international volunteer corps should only be done by committed community service warriors with a passion for development who are not tied in any way to a profit motive. I’ll say it again, I should have known better. They do some pretty amazing things. Since they started the Corporate Service Corps in 2008, over 1500 employees have volunteered in over 120 countries. IBM chooses some of its “best management prospects to spend four weeks in groups of 10 to 15 to help solve economic and social problems of their selected [community]. Teams work collaboratively with their government and community counterparts to understand how to implement socially responsible business practices with measurable results in a global context.” So, these IBM volunteers likely live out of hotels with air conditioning–and it’s only for a month, but they do get to provide consulting services within a diverse group for the benefit of foreign societies. You had to hand it to them. After hearing about this program my attention was piqued. The other initiative that stood out to me was something called P-TECH (stands for pathways in technology early college high school). IBM started what they like to call a “hollege” – a mix between a high school and a college. Together with the City University of New York, IBM created a school for roughly 400 diverse students to gain high demand technical skills through a high school diploma and an associates degree by attending from grades nine through fourteen (instead of ending in the twelfth grade). The best part, for the kids that graduate from this program, IBM said they would guarantee them a job with the company. Now, certainly one can see the self-serving aspects of a program like this. Through more collaborative learning environments and applicable technical training, IBM is essentially building a workforce to fulfill its labor requirements for the future. But the end result is still a great education for students to gain real middle-class mobility. Again, a remarkable program that I actually did remark on later that day. Almost no one has heard of this program but I get the feeling they’re on to something here. So at this point, I’m sold on IBM’s efforts. Mr. Litow went on to talk about urban renewal programs and disaster relief and I began to see the company through this executive’s eyes. One of the things a Peace Corps volunteer learns is that they will absolutely take away more from their service than they could ever give. A kind of bridge is built across cultures and projects get done for the good of the community, but in the end, it’s the experience that’s most important. For IBM’s investment in a school or a city disrupted by economic conditions, they don’t just get the satisfaction of doing “good.” They gain from it in ways that can’t be quantified. Mr. Litow spoke of the Corporate Service Corps as the “best leadership program [these IBM employees] have ever been a part of.” In these cases of corporate social responsibility that IBM engages in, they keenly know that there are realizable social goods and intrinsic values to such social service commitments. The Corporate Service Corps volunteers gain leadership skills and personal perspective that will last a lifetime; the students trained at P-TECH today could eventually become the CEOs of the future and offer the kind of innovative direction that only comes from diversity; and, in the end, if IBM gains positive brand recognition, well, they’ll do so by being authentic. Now that’s refreshing. Daniel Howard is a first year MBA at the Robert H. Smith School of Business and a current consultant with the Mayor’s Office of Employment Development of the City of Baltimore. Mt. Everest or Sagarmatha is “so high that no bird can fly [above it]” as the saying goes in Nepal. It takes a great amount of training and finances to make it to the peak of the highest mountain in the world. Why a parable about Sagarmatha, you may ask? Well, we just completed the first half of our ethics course in which Professor Lele discussed the famous case of the parable of the sadhu which raised a lot of good ethical questions. In the case, the author spent several months hiking through Nepal where he encountered an Indian holy man, or sadhu. The sadhu was left in poor health conditions to fend for himself while the group continued their way up the slope. What happened to the sadhu? Nobody knows but what has happened to Sagarmatha is very clear or I should say very dirty. Sagarmatha is prized for its beauty and I bet the view from there on a clear day must be incredible. I remember reading an article a few years back about a Japanese mountaineer that realized, as he was completing this lifetime adventure, how much the mountain was littered. In his fifth trip since he began his clean-up campaign in 2000, Ken Noguchi, brought down 1,100 lbs (500 kg) of garbage from Sagarmatha. During these five trips as part his campaign to clean up the world’s highest mountain, Noguchi has collected an estimated 18,900 lbs (9,000 kg) of rubbish from both sides of the mountain – the northern side in China and southern side in Nepal. The sad part of the story is that in 2007 it was roughly estimated that there were 110,000 lbs (50 tons) of garbage on Sagarmatha!! 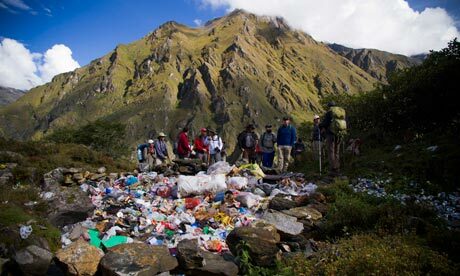 Sherpa Tenzing Norgay and Sir Edmund Hillary first conquered the mountain in 1953 and ever since every climbing expedition has left trails of litter. The good news is that since 2000, there have been several initiatives attempting to restore the mountain while educating locals as well as tourists. Clean Himalaya, which was initiated in 2000, has for passionate mission to respond to the desecration of the beauty and holiness of this region. It is a devotional response by Westerners and Indians alike who have been deeply touched by the sanctity of the Ganges River and Himalayas. Saving Mount Everest was a project initiated in 2010 and has for objective to conserve and manage the rich biological diversity of Nepal’s Sagarmatha/Everest National Park. The emphasis is on solid waste management and on supporting and strengthening local communities as the caretakers of biodiversity conservation. Nepal and India are countries in which rural communities lack the financial resources to tackle such a huge problem by themselves. However, by engaging and encouraging participation from those communities, the litter issues could be resolved using an integrated natural resources management approach. In the words of Noguchi “An alpinist goes into dangerous conditions. But the most important thing is to never give up. It’s the same with environmental problems. You can’t do it all by yourself, but if you get a group of people together, anything is possible”. Such great initiatives are reminders that as we all strive to achieve what very few have accomplished, such as climbing Sagarmatha, we should be mindful of the impacts of our actions. We all have the moral responsibility for creating value not only in our lives but also in the lives of others. So let’s be ethical leaders and inspire others to do great things together.